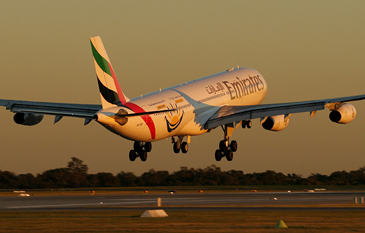 Emirates and Korean Air, respectively the second and eighth most profitable among 150 airlines worldwide, have notched another significant partnership with the signing of a codeshare agreement on the Dubai-Seoul passenger route. From Oct. 30, 2005, the two-way codeshare offered passengers of both airlines greater schedule flexibility and choice, with Korean Air's passengers now able to travel on Emirates' daily non-stop flights between Dubai and Seoul. Similarly, Emirates' passengers between the two cities have the choice of travelling by Korean Air on its scheduled thrice-weekly non-stop services. Both airlines will book passengers under its own code and flight number, deploying their own sales channels, including agents and global distribution systems. The agreement also forms the basis for members of both airlines' frequent flyer programmes to earn Miles, travelling on either airline, on the Dubai-Seoul route. The partnership also provides members the opportunity to use their Miles to redeem free flights on either airline's network. Richard Vaughan, Senior Vice President Commercial Operations East Asia and Australasia said: 'The new codeshare agreement with Korean Air exemplifies Emirates' philosophy of forging strategic partnerships on key routes. It paves the way to offer our passengers, wanting to travel to South Korea, with greater choice and flexibility. This codeshare agreement comes fast on the heels of Emirates SkyCargo's agreement with Korean Air Cargo to share cargo capacity on the latter's weekly Boeing 747 freighter flights from Mumbai and Delhi. Over the years, South Korea and the UAE have consolidated their relationship by signing several official agreements for political and economic cooperation. Trade between the two countries have flourished in the last couple of years, standing at more than US$10 billion in 2004, with the UAE being the second-largest oil provider to Korea and the largest export market in the Middle East. The major Korean export items to the UAE include automobiles; mechanical, steel and chemical products; communication and electronic goods; and household items and ready-made garments. The UAE exports oil, oil-related products and aluminium to Korea. Emirates launched daily non-stop flights between Dubai and Seoul on 1st May with flight EK322 operated by its wide-bodied Airbus A340-300 offering a total of 267 seats - 12 First, 42 Business and 213 Economy Class seats. The flight departs at 03:00 hours and arrives in Incheon International Airport at 16:25 hours; turns around at 00:30 hours the next day and arrives in Dubai at 05:50 hours. All time local. Korean Air serves Dubai with an Airbus A330-200 every Monday, Wednesday and Friday. Flight KE951 departs at 21:15 from Incheon International Airport and reaches Dubai at 03:25 hours the next day. Flight KE952 departs from Dubai at 16:00 hours and arrives in Seoul at 05:50 hours the next day. All times local. The above article is from AME Info.